Become a GoCatch Taxi Driver today. Signup as a GoCatch Taxi Driver and earn on your schedule. You determine the hours, and you’re in control. Driving for GoCatch is fun and rewarding, helping drivers meet their goals. Accepting jobs with GoCatch is as easy as if you were being dispatched jobs. 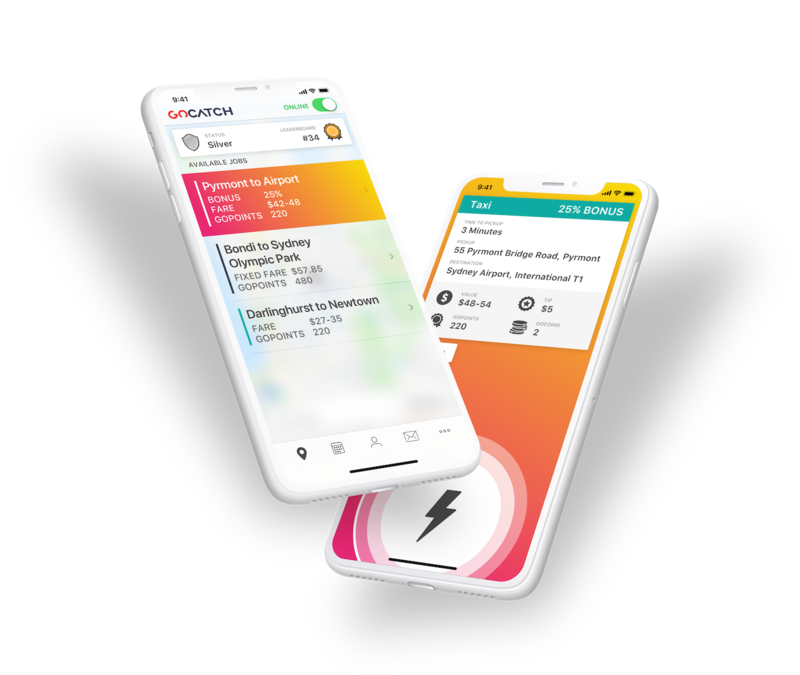 With better rates for drivers, showing the destination for jobs, Advance Bookings, GoPoints, GoCoins, the Leaderboard and Status, you get better deal with GoCatch. Our switched on Support Team is always here to help. Day or night, get in touch with us directly in the app, or email us at support@gocatch.com. All Taxi vehicles driving with GoCatch must be in excellent working condition – internal and external, i.e. must not have any significant internal or external wear and tear such as, but not limited to, upholstery stains or dents/scratches on the bodywork. All Taxi Networks in Australia are eligible for GoCatch. Premium Taxi is a vehicle class that provides passengers with a higher level of service for a higher fare. These will need to be sent via email attachment to support@gocatch.com for approval. Taxi drivers are also able to receive Economy jobs when no Economy vehicles are nearby for passengers. Taxi, Maxi and Economy job requests are labeled accordingly with fare estimates. When accepting Economy jobs, drivers do not need to use the Taxi meter. Before you get started, you may want to know how much you can make as a driver. Click below to learn more about fares and peak hours. Taxi job requests use the in-app GoCatch meter, which means you will not need to use your in-vehicle Taxi meter. At the end of the trip, the payment is automatically processed in-app and paid to your driver account.